Okay, true confessions time ... I stopped wearing deodorant. Anyone notice? Good, because it's been 6 or 7 years now! Seriously. First word, antiperspirant. Our bodies are made to perspire, that's how they breathe. Why should we be anti-that? We need to let our bodies breathe. Second word, aluminum. Deodorants contain aluminum that is considered to be safe for human use. However, research has shown that higher levels of aluminum in the body has been traced to breast cancer. There is also some circumstantial evidence that has linked it to Alzheimer's Disease but nothing is proven yet. There are more strange, can't pronounce or spell ingredients that deodorants contain that have been linked to cancers, development disorders and allergies. So if your armpits are the place where your body breathes, when we wear deodorant, they are breathing in aluminum and other unnatural ingredients that can clog and irritate our pores and go directly into our bodies. After hearing this icky info and doing a little research of my own, I decided it was time to get off deodorant and try something new. I learned alcohol-based sprays were a great alternative. Alcohol by nature, dries but does not clog your pores. My journey was a slow process, for awhile I was using both. I think my body was addicted to deodorant! But little by little, I transitioned off of deodorant and completely on to the alcohol body spray. I swear to you, my body chemistry has changed. I don't perspire as much or have smelly sweat like I used to. Now, a little spritz goes a long way! Now, it's time to start making my own and saving some money. 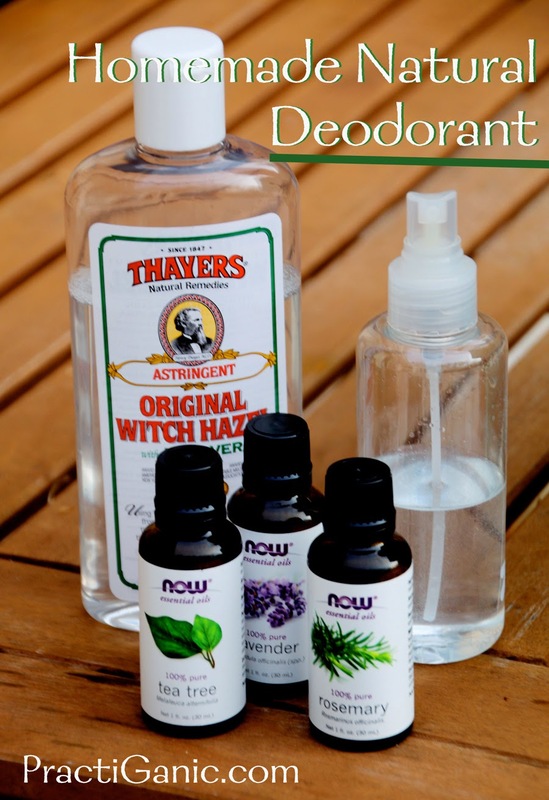 I did a lot of looking up of how to make my own and found that Witch Hazel is more gentle on the skin than alcohol. It's better for your skin too, having antibacterial properties as well as working as an astringent to help remove oils while moisturizing your skin. Give it a try and let your body breathe! Clary Sage is a great essential oil to use for sweating and it smells delicious, but it is not good to use while pregnant so I have stayed away from this one for a while now. Also, if you have sensitive skin, adding a 1/4 c of Aloe Vera Juice helps.